After years of fast and mysterious pin sell out's and many complications with their website, Disney finally listened to customers and took action for 2009. The Tinker Bell, Jessica Rabbit and LE 100 Halloween pins required customers to order them by phone and were also limited to 3 pins per design per customer - and it was to stay in effect for a 24 hour period while supplies lasted - and it was something that worked! Customers got all treats and no tricks. Jessica Rabbit as Ursula from The Little Mermaid was the favorite of that year. Jessica is totally redressed in a Ursula costume, complete with a black tentacle dress and seashell necklace, showing a lot of leg - in purple stockings and black heels. Jessica even has a tuft of grey hair, just like Ursula's. 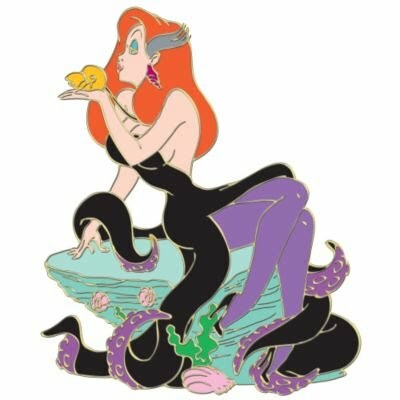 This is the first Jessica as Ursula pin to be release. There was another released at the Disney Studio Store in 2013.